HomeBrowse LibraryCan Employee Perks Help You Attract and Keep Workers for Your Small Business? Did you know that four out of five employees are more interested in benefits or perks than a pay raise? With such an increase in demand, incorporating perks into a small business should be a consideration for employers. Our infographic, “Employee Perks: Attract and Retain Workers for Your Small Business,” highlights how more vacation, flexible hours, free snacks at work, and a host of other perks may help you attract and retain workers for your small business. 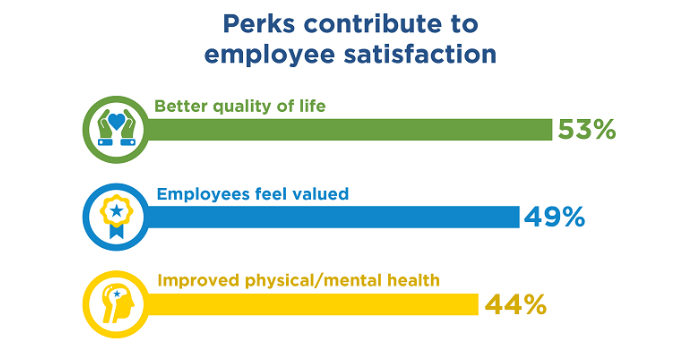 Overall, employee perks led to higher job satisfaction. Perks also provided employees a better work-life balance. An increase in employee happiness and satisfaction results in more focused, engaged and productive employees. What are Businesses Doing Now? As more research is done on the benefits of employee perks and life satisfaction, an increased number of employers are implementing them into their businesses. Although many employers are incorporating more perks into their job offerings to attract and retain workers for their small businesses, 42% of full-time employees still don’t receive any perks at all. Adding employee perks into the overall business model provides excellent benefits for both employees and employers. Employees are able to stay happy and productive in their roles while businesses get higher team engagement without having to break the bank. If you want to stand out as a small business and attract and retain the best employees, think about implementing one or two of these perks. You can always start small, and add more as you start seeing a positive response from your team. Talk with a SCORE mentor today to figure out what perks your small business can provide!